What remains. Japan, 2011, a violent earthquake gives rise to another disaster. Waves grow stronger, the tsunami reaches the coast, inhabitants are flooded, buildings destroyed, and the lives of the people who live there are gone, taken away in seconds. Left behind, as a ghostly testimonial, are the remains of the towns, one of them is Japanese photographer Mayumi Suzuki’s hometown. In her book, The Restoration Will, she leads us into a journey through the wreckage, her own family home and childhood memories stolen, almost fully destroyed under the water. An emotional quest where hope and despair meet in a compelling dialogue, tragic and beautiful. The photobook seamlessly meshes archival images from her family collection, Suzuki’s own photographs of the aftermath and images made with her father’s found large-format camera. This is combined with simple yet overwhelmingly powerful pieces of text. 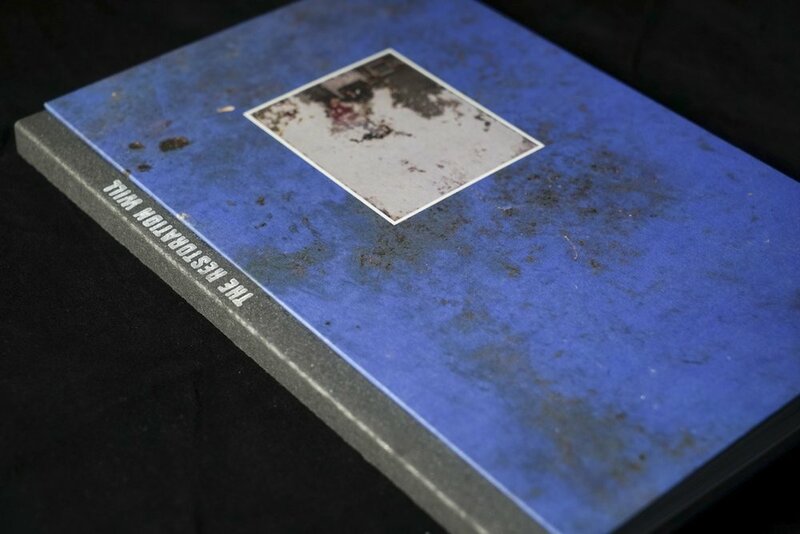 Diving in, the bright but soiled blue cover and first destroyed image from Suzuki’s childhood set the tone to the book, inviting and terrifying at once, we want to know more about this cherished, stolen past. Just as we discover the bare spine of the book, we also face the raw feelings of the artist who reveals her own despair as we dive further through the pages. At first immaculate, the family photographs displayed appear to be more and more unreadable, details disappearing, faces erased from them. Some images hang on the page, fragile, and we grasp the vulnerability of those lives, just about to fall. 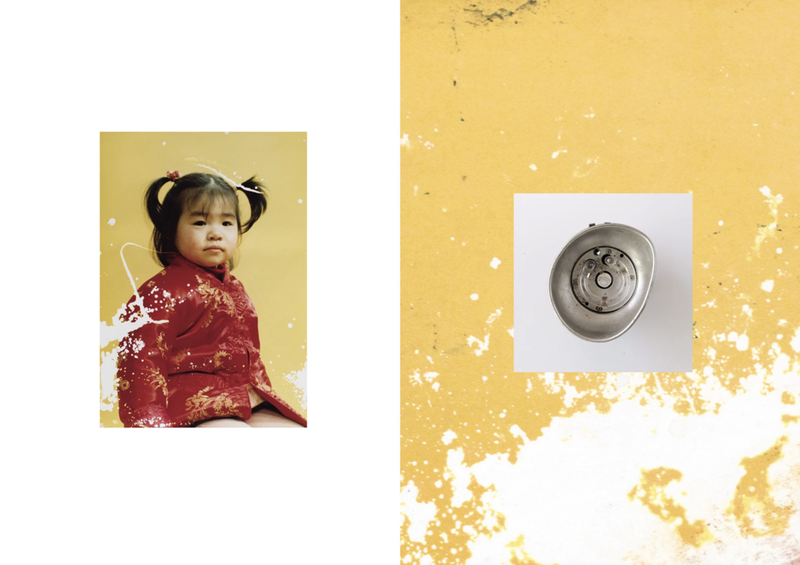 In dialogue with the partly retrieved belongings and photographs from her home and father’s photographic studio, Suzuki then points her father’s found lens at what is now left behind. 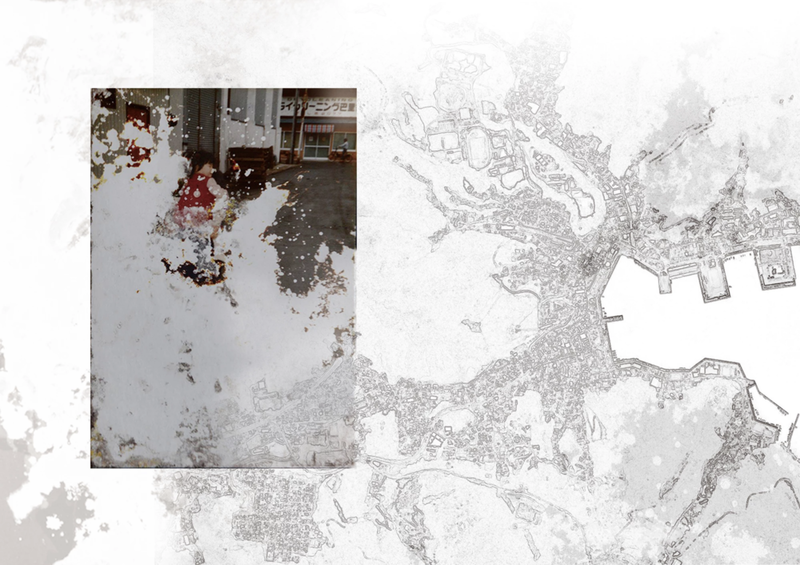 A one way conversation with her dad starts as she tries to connect with him through her own photographs, dark and hostile, staring at the wrecked land. Unfolding throughout the pages, darker and darker, we discover an even more intimate part of the story. A feeling of helplessness grows inside us as we see ourselves wanting to change this past that unveils its layers before us. Suzuki shares the last conversation she had with her parents, and the message she desperately tried to give to them, trying to save their lives. Suzuki and her sister hang on to a last moment of hope before being submerged by the reality. Death and grief are the only things left behind. Eloquently pictured, Suzuki’s personal story gives voice to a country’s tragedy and takes us at heart. The ingenuity of the gatefold pages mirrors the photographer’s exploration, an emotional path, heartbreaking, breathtaking and ultimately a message of hope and homage. Charlotte Vignau is a French artist based in Melbourne, Australia. Her practice investigates the human psyche, intertwined with the construction of myth and storytelling. Inspired by her own experiences and mythology, she creates surreal worlds rooted in the use of symbolism. Her work extends across different disciplines — photography, sculpture, installations, sound — to reveal a constructed experience. Reality is distorted in this realm of ‘mise en scene’ where facts and fiction meet to unveil the inner layers of the mind. Charlotte Vignau recently completed her Bachelor of Photography (Fine Art) at Photography Studies College in Melbourne.